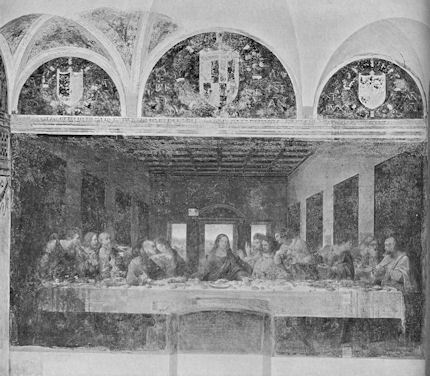 The restoration of Leonardo’s “Last Supper” (1977 -1999) was defended last month at the National Gallery symposium on the artist’s methods and influence, by Pietro Marani, the Leonardo scholar who co-directed the restoration from 1993 onwards. 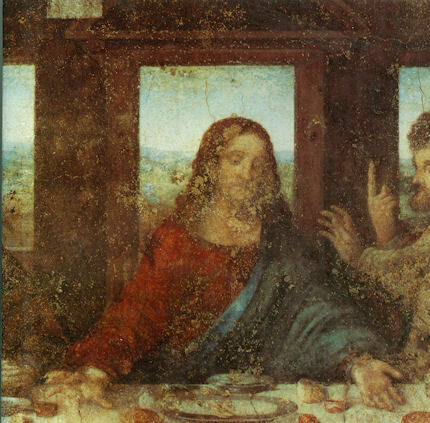 When we pointed out that while the previous restoration had been praised for recovering all of Leonardo’s authentic paintwork, the last restoration had in fact introduced vast areas of new painting, Marani held that restorers and curators may impose their own generation’s values and interpretations. Appeals to the authority of one generation cuts little ice given how happy each proves to be to undo and redo its predecessor’s work – and, besides, given that on past form we are already half way along to the next generation’s “Last Supper” restoration, the one presently being defended is already approaching its own “sell-by date”. Thus, to everyone’s satisfaction, the work had been physically rescued and what authentic Leonardo paintwork could be exposed to view had been liberated. Earlier restorers’ repainting was left in place only where it covered bare wall. Just twenty-one years later in 1975, Pinin Brambilla Barcilon, a former student of Pelliccioli’s, reported that fragments of paint were falling off the mural. Two years later, following tests, she began re-securing those parts of the paintwork that were becoming detached. Her minimal and straightforwardly necessary conservation measure was to mushroom, in parallel with the restorations of Michelangelo’s Sistine Chapel ceiling frescoes, which began in 1980, and Masaccio’s Brancacci Chapel frescoes, which began in 1981, into one the most protracted radically ambitious, corporately-funded and controversial restorations of modern times. With Leonardo’s “Last Supper”, amidst all the preliminary testing, no-one seemed concerned by the fly that was present in the ointment of Pelliccioli’s celebrated reductive, purist restoration: his liberation of Leonardo’s paintwork had come at a cost in terms of artistic legibility. 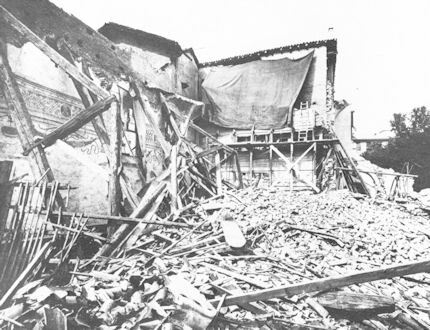 A law of diminishing returns had been set in motion that would (as we will see in Part 2) produce panic and confusion among the restorers and their supervisors. Above, Fig. 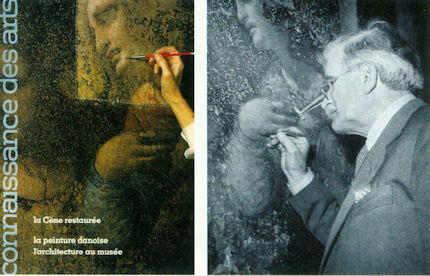 1: Pinin Brambilla Barcilon (left) and Mauro Pelliccioli (right) at work on Leonardo’s “Last Supper”. Above, Fig. 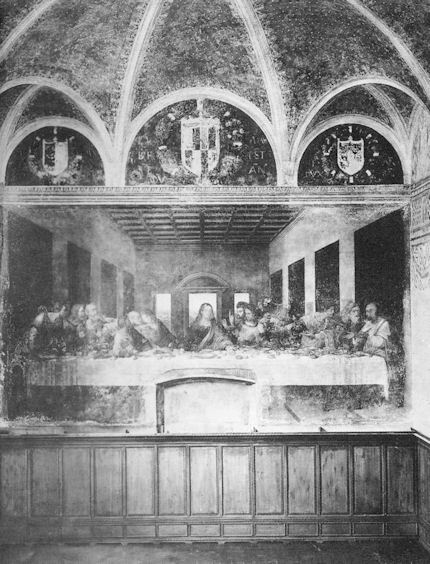 2: The “Last Supper” in the refectory of S. Maria delle Grazie, Milan, in 1900. Above, Fig. 3: The “Last Supper” before 1943. Above, Fig. 4 and below, Fig. 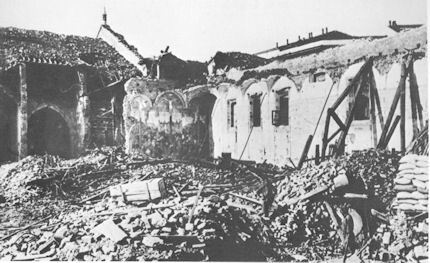 5: The refectory of S. Maria delle Grazie after the bombing of 1943. The wall bearing the “Last Supper” is present behind the tarpaulin seen below. Above, Fig. 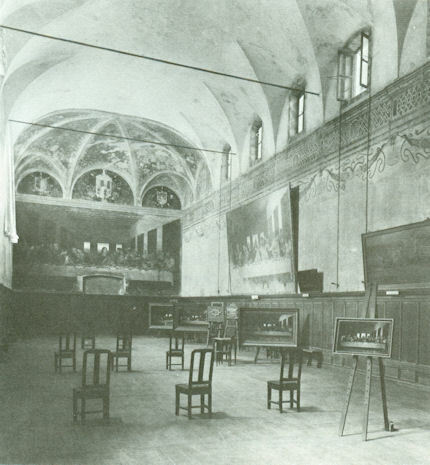 6: The rebuilt refectory with the “last Supper” after Mauro Pelliccioli’s interventions of 1947-49 and 1952-54. Above, Fig. 7: The figure of Christ after Mauro Pelliccioli’s restoration. Above, Fig. 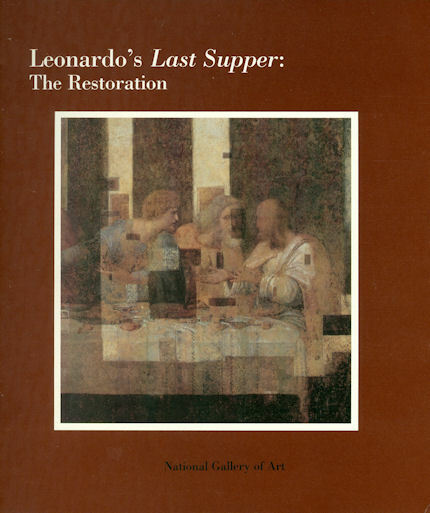 6: The cover of the third part of the catalogue for the 1983 exhibition “Studies for the Last Supper” at the National Gallery of Art, Washington. Below, Fig. 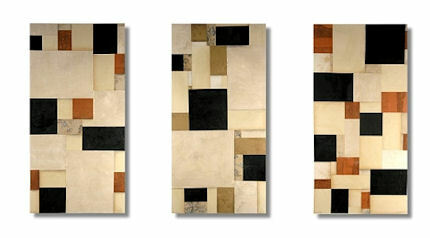 7, a de Stijl-esque work by Cecil Touchon which uncannily echoes the seeming “aesthetic” of the restorer’s bewildering method of cutting multiple ‘windows’ through the skin of the mural during the cleaning. This entry was posted on February 7, 2012. It was filed under blog and was tagged with Bernard Berenson, Cecil Touchon, Ken Shulman, Kenneth Clark, Leonardo's Last Supper, Mauro Pelliccioli, Pietro Marani, Pinin Brambilla Barcilon, The Bank of America.